Best Video Film & Cultural Center presents Deep Hamden, a three-day festival of music from Oct. 12-14. 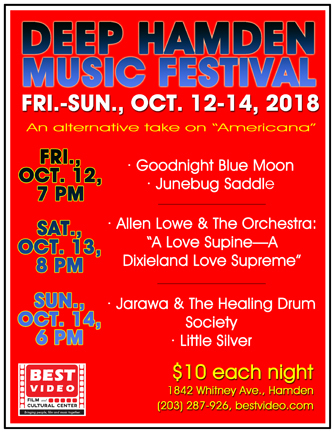 Featured artists are Goodnight Blue Moon and Junebug Saddle (Fri., Oct. 12, 7 PM), Allen Lowe & The Orchestra (Sat., Oct. 13, 8 PM), and (Sun., Oct. 14, Doors at 6 PM, Music at 6:30 PM) Brian Jarawa Gray and the Healing Drum Society and Little Silver. The cover is $10 for each night. Organized by jazz saxophonist Allen Lowe, the Deep Hamden festival is loosely based on an Americana theme. But where Americana is usually considered to be an offshoot of country and rock, in Deep Hamden Americana also encompasses jazz, Dixieland and African percussion elements. Deep Hamden originated as a festival in 2017 to honor both the range of American music and the creative community of Connecticut. The first festival included jazz, various forms of improvised music, and an African drum ensemble. The greater New Haven area is uniquely multicultural and contains a wide range of musical talent. Blending rich vocal harmonies with lush orchestrations, Goodnight Blue Moon has created a sound that is steeped in tradition, yet entirely current. GNBM is known for their energetic, honest, and dynamic live performances, offering a refreshing take on Americana roots music. Junebug Saddle is the passion project of singer, Val McKee, who longed to dig up the roots of her East Tennessee upbringing and bring some of her favorite musicians along to play in the dirt. Val and David Johnson pay homage to some of their favorite classic country, folk, and Americana musicians, in addition to originals and “countrifying” songs they grew up on. Allen Lowe & The Orchestra perform “A Love Supine: a Dixieland Love Supreme,” first performed at Dizzy’s at Lincoln Center in February, 2018. Though the suite is somewhat of a tribute to John Coltrane, it is as much an examination of American modernism, particularly as it pertains to jazz and improvised music. A 2-CD set of this program will be released in February 2019 by the legendary jazz label ESP Disk. The Healing Drum Society is led by Brian Jarawa Gray, better known as Jarawa. Jarawa has more then 30 years of experience as a percussionist, songwriter, band leader and performing artist. He has taught world music in public and private schools and universities in Connecticut and New York. Jarawa performs Natural Centric Drumming and the music of the African Diaspora. Little Silver released their debut album “Somewhere You Found My Name” July, 2017. Based at the time in Brooklyn and now relocated to Hamden, Little Silver’s music is built around the ethereal vocals of married duo Erika Simonian and Steve Curtis. “Somewhere You Found My Name” is a gorgeous collection of original songs that confront the shifting landscape of gaining and losing loved ones, changes in perspective, and the uncertainty of life itself. Little Silver’s sparse arrangements and beautifully understated vocals bring these everyday truths to life. Simonian and Curtis will perform as a duo for this show. 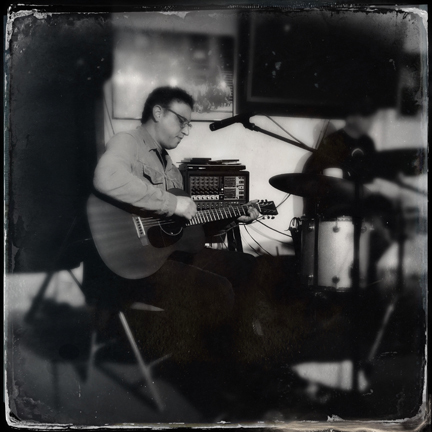 It’s a night of solo sets from Matt Wheeler of Matt Wheeler & Vintage Heart and Jon Schlesinger of No Line North, and a duo set from Mat Crowley & Erik Elligers of Goodnight Blue Moon at Best Video Performance Space on Saturday, Nov. 5. Come out to hear some great singer-songwriters play some tunes in one of the best listening rooms around, Best Video Performance Space. The show starts at 7:30 PM and the cover is $5. Matt Wheeler. Photo by Ed Polakoff. 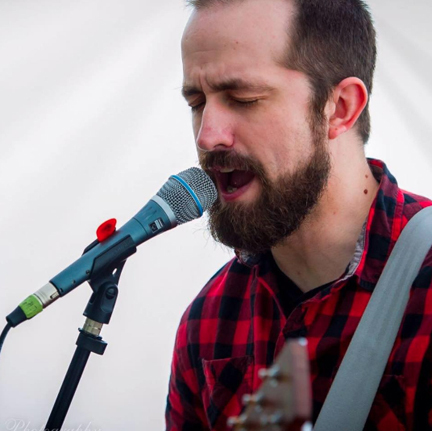 Pennsylvania-based Matt Wheeler’s songwriting has gained a reputation for its crisp, taut lyricism and poetic, honest approach, and for its ability to paint vivid pictures with words. Balance that with the rhythm section’s driving bass & drum groove together with the haunting and sweet strains of the violin and the cello, and you have an orchestral folk sound that will draw you in & reward repeated listens. Live shows add in Matt’s signature inviting & fun stage banter. Matt Wheeler & Vintage Heart’s songs have sparked the interest of WXPN, WJTL, Fig Magazine, Fine Living Lancaster, Good Day PA, Fox 43, & numerous other media outlets. Mat Crowley (left) and Erik Elligers (right) of Goodnght Blue Moon. 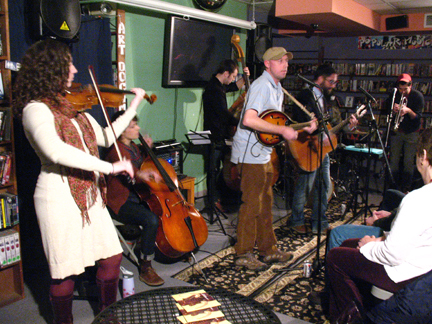 Goodnight Blue Moon is an indie-folk band from New Haven, Connecticut that has been playing together since 2009. Instrumentation includes cello, violin, mandolin, guitar, banjo, upright bass, trumpet, and drums, which support rich vocal harmonies. With songs that range from Americana and bluegrass-based traditional folk to through-composed and orchestrated pop, Goodnight Blue Moon’s style is eclectic, thoughtful, and danceable at the same time. Goodnight Blue Moon songwriters Erik Elligers and Mat Crowley will play as a duo at this show. Jon Schlesinger is the principal singer/songwriter for Connecticut based No Line North, a band that cultivates a blend of psych-folk/garage rock & americana into a uniquely unified sound. He’ll be playing solo acoustic and incorporating loops and other effects to re-interpret originals and covers for this show. The renowned Americana band Goodnight Blue Moon plays the Best Video Performance Space on Wednesday, Oct. 8. The music starts at 8 PM and the cover is $5. Goodnight Blue Moon, from New Haven, Connecticut, writes pop songs on folk instruments. By combining 60’s vocal harmonies, traditional roots influences, and catchy orchestrated melodies, GNBM is what New England Americana sounds like. Having already shared the stage with folk heavy weights (Spirit Family Reunion, Joe Fletcher and the Wrong Reasons, Hurray for the Riff Raff, and Frank Fairfield), they play high energy and dynamic sets that get an entirely packed room dancing and singing along. They have successfully merged styles and sounds that, at first glance on paper, probably shouldn’t work. But by sheer will and muscle they’re proving that with enough talented players in your troupe that you can take great songs, structure them any damn way you please and create a unique and enjoyable listening experience. CT.com also included How Long on their annual year-end list of the best Connecticut albums of 2012. 2013 brought more accolades for Goodnight Blue Moon as they were voted by Connecticut music fans as the “Best Folk/Traditional Band” at the 2nd Annual Connecticut Music Awards. They were one of a very small handful of bands to be nominated in multiple categories, including the “Best Overall Band” category. They were also invited to perform at the ceremony on the prestigious Bushnell Theater stage, along with knockout performances at the annual CT Folk Festival, The Block Island Music Festival, The Meriden Daffodil Festival, and venues all across New England. 2014 brings with it the promise of more music from Goodnight Blue Moon as the band readies for a January release of their newest EP, A Girl I Never Met, a six-song venture further into the hearts and minds of listeners. This release is followed by a heavy schedule of live performances and festival appearances including spots already secured on Hartford’s Emerge Festival and the Podunk Bluegrass Festival. Goodnight Blue Moon will play the Best Video Performance Space on Wednesday, Sept. 11. The music starts at 8 PM and the cover is $5. 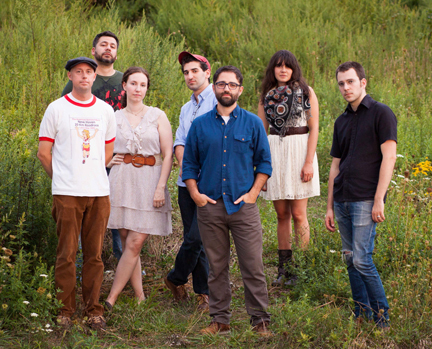 Goodnight Blue Moon is an indie-folk band from New Haven, Connecticut that has been playing together since 2009. Instrumentation includes cello, violin, mandolin, guitar, banjo, upright bass, trumpet, and drums, which support rich vocal harmonies. With songs that range from americana and bluegrass-based traditional folk to through-composed and orchestrated pop, Goodnight Blue Moon’s style is eclectic, thoughtful, and danceable at the same time. Goodnight Blue Moon includes guitarist and singer, Erik Elligers (Pencilgrass, Mountain Movers), singer and mandolin player, Mathew Crowley (Dudley Farm String Band), Nancy Matlack Elligers on cello and banjo, Sean Elligers on trumpet and vocals, and Carl Testa (Uncertainty Music Series) on upright bass. The group recently added Vicki Wepler on violin and Nick D’Errico on drums. This latest rendition of the group may get a bit crowded on stage, but the new line-up is the most energetic and full sounding yet. GNBM released How Long, their first full length record, in March, 2012. Recorded in Lyric Hall Antiques and Restoration and their apartment, the new album includes mostly originals and also features a full string section on several songs. The group was recently featured on Connecticut Public Radio’s “Where We Live” program. Goodnight Blue Moon is an indie-folk band from New Haven, Connecticut that has been playing together since 2009. Instrumentation includes cello, violin, mandolin, guitar, banjo, upright bass, trumpet, and drums, which support rich vocal harmonies. 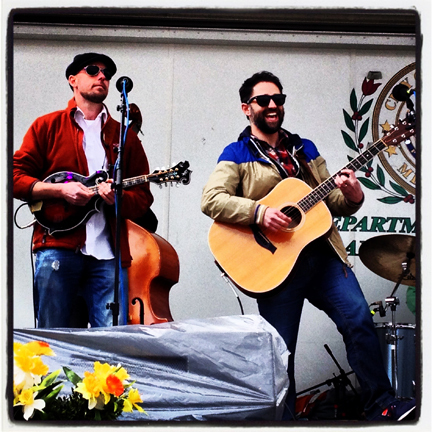 Their style ranges from Americana and bluegrass-based traditional folk to through-composed and orchestrated pop. Goodnight Blue Moon includes guitarist and singer, Erik Elligers (Pencilgrass, Mountain Movers), singer and mandolin player, Mathew Crowley (Dudley Farm String Band), Nancy Matlack Elligers on cello and banjo, Sean Elligers on trumpet and vocals, and Carl Testa (Uncertainty Music Series) on upright bass. The group recently added Vicki Wepler on violin, Nick D’Errico on drums, and Sean Milnes on banjo. This latest rendition of the group may get a bit crowded on stage, but the new line-up is the most energetic and full sounding yet. In their previous two visits to the Performance Space the band has played as a quartet with acoustic guitar, mandolin, cello and upright bass. This time they will bring their expanded ensemble. The music starts at 8 PM and the cover charge is $5. 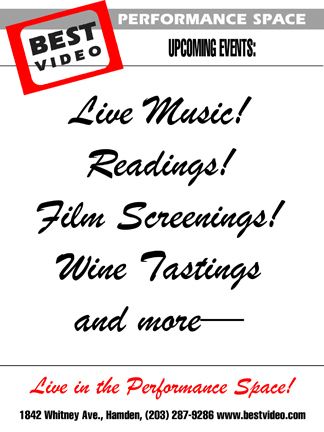 The Best Video Coffee & Wine Bar will be open, serving specialty coffees, wine and beer.